Tourist season is almost upon us. I can tell by the different mix of cars going down Beach Hollow Road, the main shopping street in Cranberry Cove. Mixed in with the pickup trucks and early model American cars are cars with fancy European lineages like BMW, Mercedes and Lexus. Tourists tend to dress down here—Cranberry Cove is right on Lake Michigan and the perfect place to relax so you’ll find them garbed in shorts and T-shirts like the rest of us only their clothes will have well-known logos on them like Ralph Lauren and probably don’t come from Sears. And their flip-flops are from Coach and not the corner drugstore and they carry totes by Kate Spade instead of hauling their stuff around in a recyclable grocery bag. And they’ll be dining at the Cranberry Cove Inn or sipping drinks at the Cranberry Cove Yacht Club when they’re not out on their boat. We locals don’t mind (and I know I’m being awfully brash calling myself a local when I’ve been here less than a year). It means money in the town coffers so we deal with the extra traffic, the crowded sidewalks and the noise. But come November we’ll be breathing a sigh of relief at having Cranberry Cove all to ourselves again. I'm celebrating the upcoming release of Berry the Hatchet, #2 in my Cranberry Cove series by giving away a copy to someone who comments below! Cranberry Cove sounds like a fun place to visit. Thank you for the chance to win. Looking forward to reading the new book. 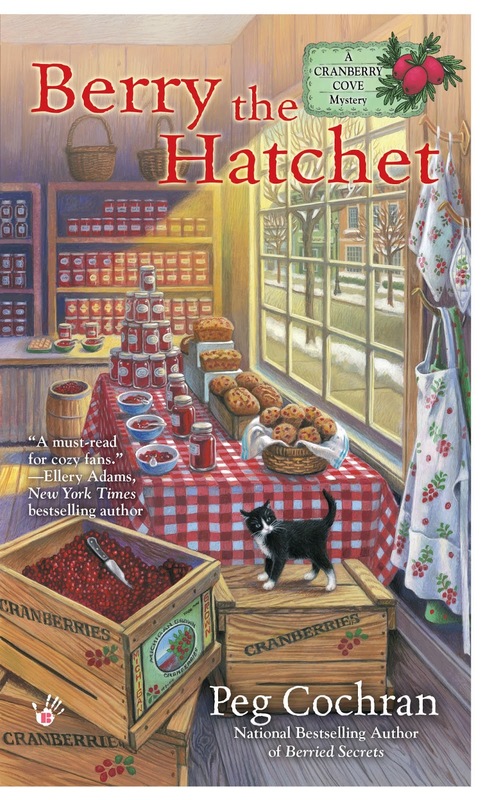 I can't wait to read the second book in this series—Berry the Hatchet! I own the first book in the series (Berried Secrets) and enjoyed it thoroughly. I'd love to win book two to add to my home library. I loved the first book and am anxiously awaiting to read BERRY THE HATCHET! Thanks for the chance to win! I'm looking foward to reading this. First book was terrific so I'm looking forward to Berry the Hatchet. The tourists are about to take over our town, too---I prefer the quiet of the winter. Thanks for the contest. Would love to continue the series with this book. Thanks for the giveaway. And why did I suddenly think of Jaws? I enjoyed the first book and would like to read this one very much! Thanks! Living in south Florida I know all about seasonal visitors. I would love to read Berry the Hatchet (am also looking forward to the Berry the Hatchet seasonal beer that you wrote about -- it comes out on May 1st!) ~ Thanks for the giveaway! Can't wait to read this! Thanks for the giveaway! Enjoyed the first one and am eager to read the second. 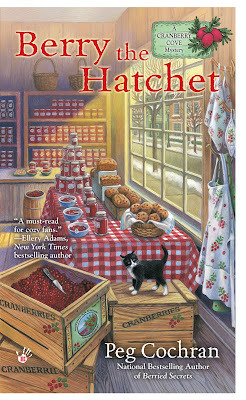 I fell in love with Berrien Secrets , now I have to read Berry the Hatchet ! Thank you for the chance to win. I'm exited to read the new book in this series. I have been since I finished the first one. I live in a seasonal small city myself. We are basically the gateway to Zion National Park and the place for Mormons to "party" during spring break. We also get a ton of retirees, either permanent residents or snowbirds who leave during our blistering summer season and outdoorsy types who love to ride their bike, hike or jog in 100 degree temps (crazy, yes!). But crowds on the streets are definitely something we are familiar with and complain about. ;) Most locals try to find short cuts around major thoroughfares. p.s. The book cover is beautiful! I would absolutely Love to win this book! Cranberry season sounds like a marvelous vacation opportunity... I'd love to join in the adventure! Would like to read "Berry the Hatchet". I haven't started this series yet and I'm looking forward to reading. I would love to read Berry the Hatchet. Thanks for the chance to win! Thank you for the chance. This book sounds great. Cranberry Cover sounds like a great place. Cranberry season means fall and cooler weather and maybe snow and I love it all! We're just getting into one of my home area's biggest tourist draws, so I totally get how it feels. I mostly just try to stay away from it all (or at least watch what festivities I can on TV). Maybe this year I can read Berry the Hatchet during this year's partial seclusion? A girl can hope. :) Thank you for the chance to win. I love the tang of cranberries. Looking forward to catching up on my reading too thank you. Our area's biggest tourism draw is the Somernite Cruise, the 4th weekend of the month Apr-Oct. Other than that, it's pretty dead (no pun intended). We count rush hour if there are more than 3 cars in 1/2 an hour that go by our house. luann(dot)braley(at)gmail(dot)com. Loved the first book, hope I can win this one, Thanks for the chance. I would love to read this, thanks for the chance! Looks like a good one. We live in a tourist type town too. Thank you for having the nice giveaway! The book looks like an awesome read and I would love to read it. 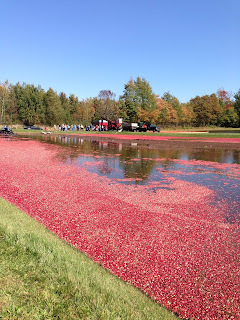 Thoroughly enjoyed Berried Secrets and learning a bit about harvesting cranberries. I'm looking forward to Monica's next sleuthing adventure! What a great giveaway. This book is now on my TBR list. Thanks.